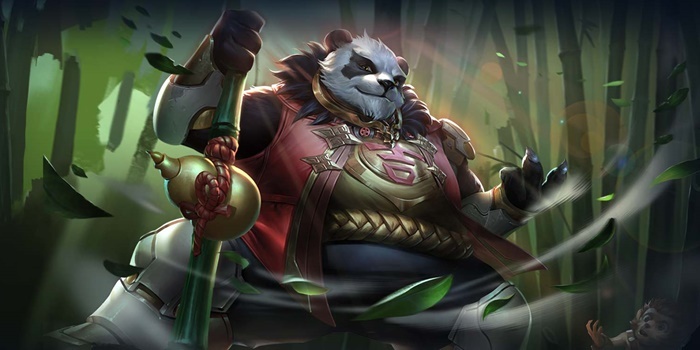 Guide for the hero Zuka, a character in Arena of Valor (AoV). Included are Zuka’s abilities, statistics, attributes, strengths, weaknesses, and more. These are Zuka’s attributes on the mobile version of Arena of Valor. Click here for his attributes on the Nintendo Switch version. Every 15 seconds, dealing damage to an enemy hero triggers Zuka’s Chi, increasing his attack damage by (15/20/25/30)% of attack damage (increasing at level 5/9/13) for the next 5 seconds. Zuka will glow when the effect is active. This effect stacks with his abilities’ empowerment of auto attacks. The additional damage also affects towers when active. Zuka raises his staff and charges forward, dealing 135/160/185/210/235/260 (+0.9 AD)ˀ physical damage to nearby enemies. This ability can be used again within 5 seconds of the first use and each use enhances Zuka’s next normal attack, increasing its range and dealing an additional 60(+20 per level)(+0.25 AD) physical damage. Auto attack first before using this ability to avoid wasting damage. The ability’s cooldown starts after the second use of the skill or five seconds after the first use. Zuka rolls forward, dealing 100/120/140/160/180/200 (+0.35 AD) physical damage to enemies in his path. On a successful hit, Zuka gains a shield that absorbs 250/300/350/400/450/500 (+1.5 AD) damage for 2.5 seconds and enhances his next normal attack to deal an additional (+0.5 AD) physical damage and knocking enemies into the air for 1 second. When the shield disappears or is destroyed, Zuka gains a recovery effect that recovers 30 (+10 per level) (+0.1 AD) per second for 3 seconds. The shield will activate no matter what kind of unit Zuka strikes. Zuka leaps up and crushes his enemies from above, dealing 500/650/800 (+1 AD) physical damage to enemies in the target area and stunning them for 1 second. His next normal attack will deal an additional 70 (+40 per level) (+0.25 AD) physical damage to nearby enemies. As with all of Zuka’s abilities, do not forget to auto attack right afterwards. Zuka gains a shield from successful hits with Panda Chariot, so make sure you hit an enemy or a monster when you use this ability. Zuka’s positioning abilities take him through most obstacles and can produce unexpected effects on certain terrains. Our recommended order for Zuka abilities as he levels up. See all of Zuka’s item builds.